WinADay.com, Slotland.com’s new 3D online casino, has just launched yet another new game, the Slot-O-Matic. The site already features several elaborate multi-payline games but this time has kept it simple for players that like to stick to the basics. The new Slot-O-Matic is an easy one payline, three-button slot machine. To celebrate the launch of this great new game, destined to be an instant classic, WinADay.com has two special bonuses on offer. Playing Slot-O-Matic couldn’t be simpler. There is just one payline with three plus one reel windows. The symbols are fruit machine classics: cherries, lemons, lucky sevens and the like. Game play is easy – just spin the reels and hope for three matching symbols in the first three windows. If there are two matching symbols on the first spin, players get an extra spin for one more chance at a third in the bonus window. The only decision to be made is how much to bet. 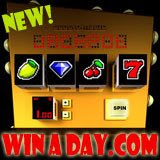 For those that want a chance to win WinADay’s progressive jackpot, even that decision is an easy one: bet max!